Hello again! This week the entire team has been working extra hard as we head down the final stretch of getting mission 2 launched. We’ve completed scripting start to finish, and have been cranking away on polish and of course bug fixing. I’ve also been doing some final art passes as well as adding some special effects. Balancing has been ongoing but I’m happy to say I feel it’s nearly where it needs to be so it offers a serious challenge to players of all skill levels (I hope!). Dialogue has been locked down and we’re going to be sending it off to professional voice actors soon, if all goes well we intend on having mission 2 out before Christmas! We’re pretty far along with Vacancy, so my task this week was to replace the temporary character models with the ones we plan on using for release. Definitely makes the game feel a little more complete! Lots of fiddling importing and tweaking of models/textures. On top of that, we wanted to add a new feature to the game: the exploding barrel propane tank! Pretty simple, does what it says on the tin. You shoot it enough, it explodes. You can also throw them...as they catch fire. Good luck and godspeed. This week I spent a large amount of time sitting at my desk staring into space, wondering if Lawrence would do my dev blog for me. He didn’t. 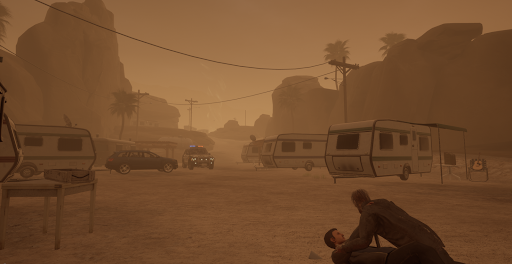 This week we have been crunching getting vacancy (mission 2) to a release-ready state. So many bugs fixed, so much tightening up of all the events, adding new functionality to our tools to allow us to better get this level to be what it can with the release date drawing ever closer. We are also drawing on feedback from testers, and are getting aspects of the gameplay more dialed in. We are particularly happy with the second phase of the new content, it’s turning into a really enjoyable rampage through the apocalypse.